For over 40 years the remains of dictator Francisco Franco have lain in the mausoleum outside Madrid known as the Valley of the Fallen. However, the intention by Spain’s Socialist government to pass a decree on Friday ordering the remains be exhumed has led to a political row, with Spain’s People’s Party (PP) and Ciudadanos (Cs) parties against the move. If both parties refuse to support the decree, its approval will be in the hands of the pro-independence parties and Unidos Podemos – which includes Catalan force En Comú Podem, non-aligned over independence. 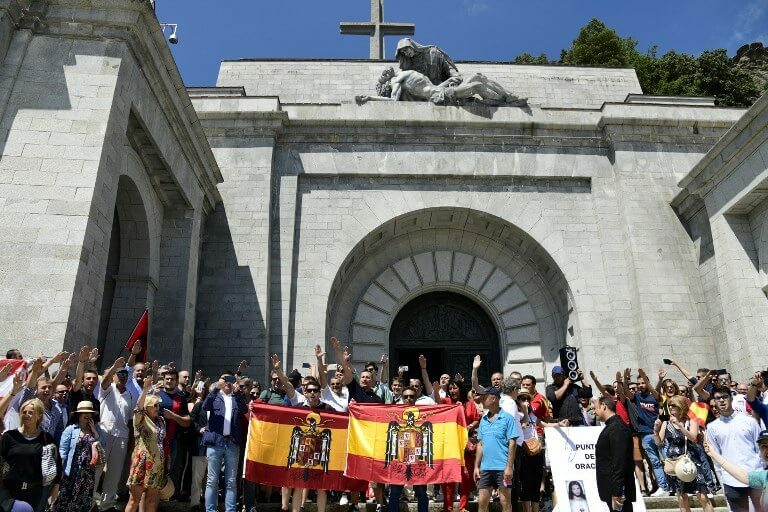 People make the fascist salute at the Valley of Fallen on 15 July 2018 as they protest against exhumation of Franco. ‘Cs and PP are competing to see who can act most like a caveman out of the two,’ said Alfred Bosch, of Catalonia’s Esquerra (ERC) party. Bosch called it ‘incomprehensible’ that Cs and PP should oppose the public display of symbols supporting jailed political leaders and not favor the removal of Franco’s remains. ‘A mausoleum devoted to the memory of a military dictator does not affect the neutrality of the public space?’ Bosch asked rhetorically. Bosch went further, saying that his party not only supports the efforts to exhume the dictator’s remains, but is calling for a ‘complete review of the injustices of the dictatorship’, with the overturning of sentences handed down by the Franco regime, such as the execution in 1940 of the then Catalan president, Lluís Companys. Yet PP is threatening to appeal to Spain’s Constitutional Court should the government pass the decree modifying historical memory legislation to authorize the removal of Franco’s remains. According to a PP spokesman, the urgency of the move is ‘not justified’ and he accused the minority Socialist government of governing by decree and currying favour with parties, such as ERC and Podemos. ‘The only urgency is for [Pedro] Sánchez to continue as president, Spaniards are in no hurry to dig up a dead man who has spent 40 years in his tomb,’ said the PP spokesman. Cs was also critical of the move, with party leader Albert Rivera arguing that government decrees should be reserved for ‘urgent’ matters and stating that his party will not vote to ratify the decree when it goes before the Spanish Congress. ‘If all we are to debate is what happens to Franco’s bones then we will not support it,’ said Rivera in a radio interview on Wednesday. If the Spanish government goes ahead and approves the measure in Friday’s cabinet meeting, Spain’s lower chamber has a month to ratify the decree authorising the removal of the dictator’s remains. In a 2017 parliamentary motion calling for Franco’s exhumation from the Valley of the Fallen put forward by the Socialist party, then in opposition, Cs voted in favour, with PP choosing to abstain. The spokesman for the Socialist party (PSOE) in Congress, Adriana Lastra, called on Cs to ‘reconsider’. ‘We call on them to rethink, it is urgent because we are 40 years behind,’ Lastra said, who added: ‘It is a democratic anomaly in the 21st century, and in full democracy, that there be a mausoleum devoted to a dictator.’ Lastra also said that her party fully supports ERC’s wish to see sentences from the Franco regime overturned. Catalonia’s other pro-independence party, Junts per Catalunya (JxCat), reacted to Cs announcement that it intends to abstain with sarcasm: ‘They say they are not neo-fascists. They are in the centre. Soon they will explain how Franco built reservoirs and invented holidays,’ JxCat spokesman, Eduard Pujol, posted on Twitter. PDeCAT, JxCat’s base party, was one of the parties that supported the Socialists’ no confidence motion that ousted Mariano Rajoy’s PP government, leading to Sánchez becoming Prime Minister in June.